In 1906 there appeared an interesting book entitled A smaller social history of ancient Ireland, treating of the government, military system, and law; religion, learning, and art; trades, industries, and commerce; manners, customs, and domestic life, of the ancient Irish people: https://archive.org/details/smallersocialhis00joycuoft. Between those green covers, the author Patrick Weston Joyce had managed to fill its 574 pages with the lore of ancient Ireland, traditional folklore still alive and well, just 112 years ago. This book is an abridgement of that author’s larger work A social history of ancient Ireland, though both are of inestimable value to the serious student of the culture and traditions of the Irish people. Chapter 20 introduces the emblematic importance of swords in Celtic society, as badges both of rank and honour, and of course the mystique of each blade’s creation. 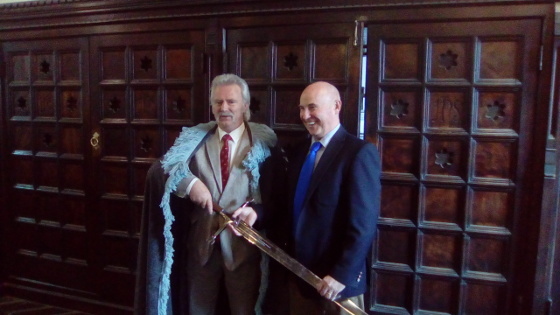 It is envisaged that the Clans of Ireland sword, commissioned and presented by the O’Brosnan Clan of Brosna, will serve to remind us all of its significance in Irish society, as well as to the history of our nation. Primarily, of course, any Celtic or other sword is a weapon. Culturally, it was much more significant than that simple but accurate description allows. The creation of the blade by the Blacksmith was viewed as magical, as an exhibition of the power of the Smith, and by extension his community, to control those raw products and forces of nature and to refine them into an object that was serviceable, yet also possessing significant artistic merit. In those times, and up to the more recent past, even the very water that the Smith used to quench the blade during its making was considered to have a magical and curative value. The totem value that Irish communities placed upon those ancient blades must account for their appearances in archaeological digs and chance finds as ritual sacrifices, carefully broken and equally carefully placed in some sacred place by, or under, running water. These were significant sacrifices, necessarily causing considerable financial and prestige loss to the community by their destruction. Echoes of that same sacrifice by water can yet be detected in the later legend of Excalibur. That sword, returned to the lake by the dying king, was reputedly engraved on alternate sides of the blade with ‘Take me up’ and ‘Cast me away’. 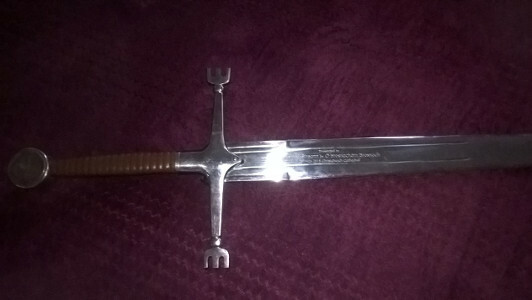 Given the preponderance of Celtic cultural significance invested in those legendary swords, it is appropriate that Clans of Ireland too possess its own emblematic sword, particularly as the origin of Excalibur is the real sword Caladbolg, borne by King Fergus of Ulster in the saga Táin bó Cúailnge, ‘The cattle raid of Cooley’. Our sword will recall Caladbolg, and the time when the Red Branch Knights policed the peace, tranquillity and traditions of ancient Ireland. It too will remind us of later episodes in our history, when similar military needs would see the rise of a parallel warrior cast, the Hiberno-Norse-Scottish gallóglaigh or gallowglass, who proudly bore their own emblematic two-handed sword, the claíomh mór or claymore. Or still later in that rich tapestry of Ireland’s history, when Eoghan Ruadh O’Neill began a tradition of Continental service, employing the legendary skills of the Irish swordsman in the Spanish and French military establishments. These Irish swordsmen would indeed thrill European society with accounts of daring-do, culminating perhaps in the rescue of Princess Clementina Sobieski from imprisonment by that ultimate Irish gentleman swordsman, Charles Wogan, formerly of Rathcoffey Castle. It is therefore our hope that this Clans of Ireland ceremonial sword will give many years of service to our organisation, and recall the skills and bravery of the Irish nation and our diaspora, in those hard times when the resolve of our Irish people and nation were sorely tested, yet still proved as true as that tempered blade, carried into battle by our illustrious forebears.